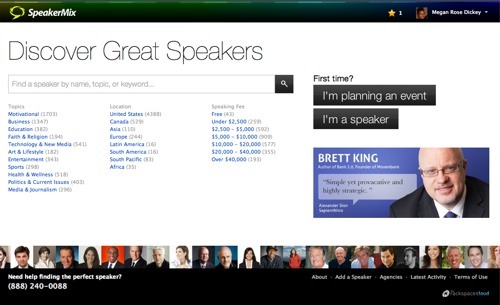 WHAT: Help meeting and conference planners find the right speaker for their event. 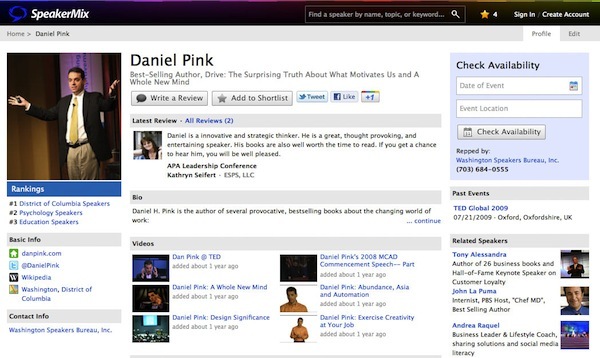 Based on the wiki platform, speakers, agencies and event planners contribute to the SpeakerMix directory by adding speakers who specialize in different subject areas, including business, technology and sports. Event planners can search for speakers based on name, topic, location, keyword or fee, and browse through reviews before contacting. LAUNCHERS: Jack McGary, CEO. Taylor Brooks, Co-founder. WHY: It's hard for event planners and appropriate speakers to discover each other. 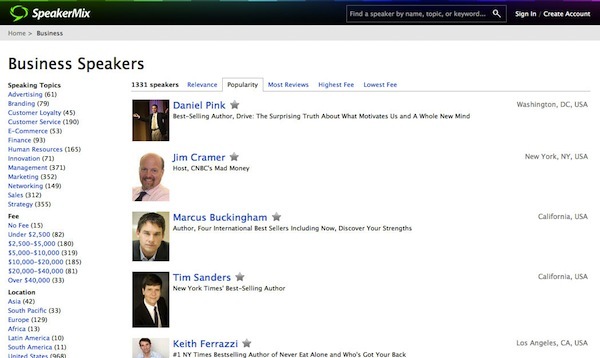 Not much good info on speakers beyond bios, and publicists often write the reviews. Many people planning events are not actually professional event planners but get thrown into the role. Domain experts do not always have agents -- only celebrities do -- and don't have the time or interest to promote themselves as a speaker. BACKSTORY: Jack and Taylor used to work at one of the largest speaking agencies in the world, Premiere Speakers Bureau, but got burnt out. In 2008, Jack left the agency and moved to Boulder to get into the startup scene. "I kind of had the startup bug," Jack tells LAUNCH. "I knew something had to be done differently." Taylor, on the other hand, went to Texas with the goal of starting a grilled-cheese food truck. Taylor and Jack both worked for a couple of startups before collaborating to create SpeakerWiki -- now known as SpeakerMix. BUSINESS MODEL: SpeakerMix charges speakers a fee -- to be determined -- when a speaker get booked. "We haven't decided exactly how we're going to charge yet -- traditional agencies typically earn a 20-30% commission," Jack told LAUNCH via email. ON COMPETITION: "We're really laser focused on the meeting planner," Jack tells LAUNCH. "We have honest reviews on our site." CUSTOMERS/GROWTH: 6.5K speakers on the wiki. 500+ new sign-ups monthly. Since entering Capital Factory in June, SpeakerMix has done $500K+ in bookings. The Agency Group, one of the world's leading booking agencies, recently signed up. ON THE AGENCY GROUP: "They have a lot of their artists who are looking for new distribution channels," Jack says. "Part of that is doing speaking opportunities." GOAL: "The real focus is on serving speakers," Jack says. SpeakerMix aims to "give speakers a way to build their reputation and to provide tools for meeting planners." ON CAPITAL FACTORY: "Experience at CapFac was great -- they helped us to really put 100% of our focus on building a product around the customer," Jack tells LAUNCH via email. "Marketplaces are also really tricky because you have to create a product for both buyer and seller -- having access to mentors who have built marketplaces in other industries was hugely helpful." WHO BACKED IT: Capital Factory. Event planners can sort through results based on relevance, popularity, most reviews, highest fee or lowest fee. Event planners can view individual speaker profiles to read reviews, watch video from speaking events, check availability and more.